The Nturanyenabo family in Rwanda is enjoying a recent addition behind their house, and it’s more than a cosmetic upgrade. Their new latrine affects their health and that of their neighbors and guests. Though Jean Damascene Nturanyenabo didn’t prioritize having a modern latrine, life without it was at times both challenging and embarrassing. What made the family finally upgrade their latrine? They learned about the hazards of open sewage from their community health club, supported by Catholic Relief Services’ Gikuriro Program. The Nturanyenabos are members of a local health club called Isoko y’Ubuzima, meaning “the source of healthy life.” They attend club meetings and activities weekly. The club teaches people about sanitation and hygiene to improve their environmental health and nutrition. Some families do not lack a latrine or hygiene and sanitation practices because of poverty, but because they have no information about the associated benefits and risks. Sharing this knowledge is a key goal for members of the community health clubs. 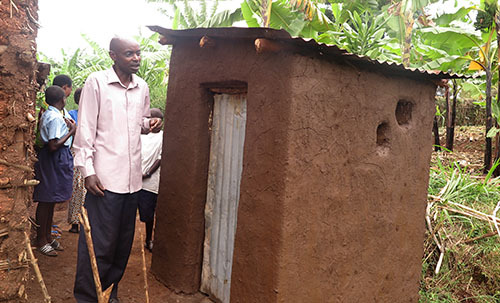 Jean determined to upgrade his latrine after a random joint visit to his home by Gikuriro and Rwamagana District authorities, including Vice Mayor of Social Affairs Umutoni Jeanne. Jean promised to practice all the hygiene and sanitation skills he gained from the club at his home. 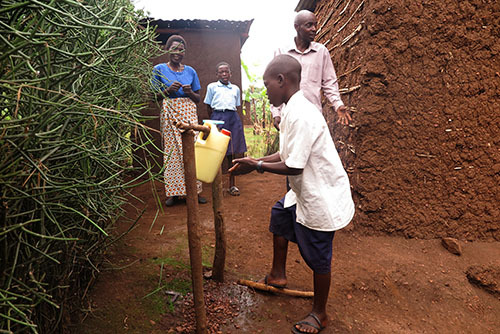 Along with the new latrine, he also installed a tippy-tap so family members and guests can wash their hands. Community health clubs members are determined to ensure their village is clean. Recently, they decided to build a public latrine along the Kigali-Tanzania Road, a national road that passes through Gatika Village where truck drivers stop to sleep. Drivers use the nearby forest to defecate, and the club members realized this increases the risk of diseases in their neighborhood. CRS has mobilized the construction of more than 8,000 new latrines in 8 districts since its program started. Some of them have been built by families without outside assistance. For the district’s poorest families, CRS and club members are providing iron sheeting and free labor. Gikuriro is a 5-year project funded by the U.S. Agency for International Development, with additional support from the Netherlands Development Organization and the African Evangelistic Enterprise. It serves 8 districts, reaching approximately a quarter of the Rwandan population, and has helped establish 1,454 health clubs to date.